If your directory is a property directory, you may want users to be able to view property listings within a certain price range only. Or if it is a restaurant directory, some visitors may only be interested in finding restaurants that serve Thai cuisine. This is where filters come into play. Filters allow your site visitors to limit or narrow content items displayed based on additional criteria. If your directory contains a large number of content items, then filters are a must-have for improving site usability. Visit the directory index page in the frontend to play around with the default filters already setup for your directory by the system. 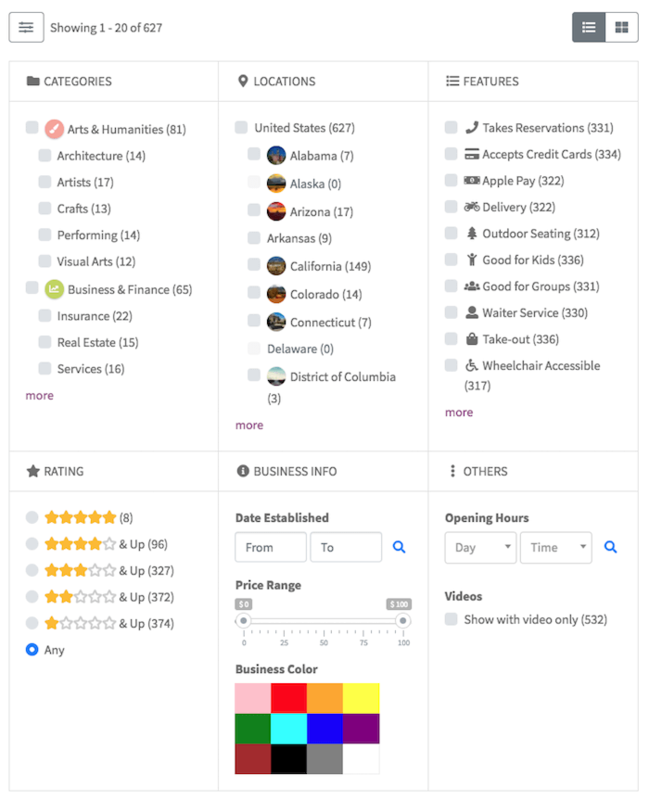 If your site does not have enough content to test the filters, you can try it on our demo site at https://demo.directoriespro.com/listings-with-filters/. 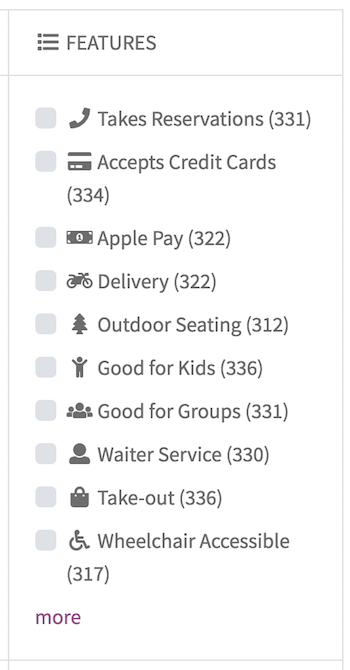 Click on the filter button above the listings to open a filter form. Try clicking on the checkboxes or changing the values in the filter form and see how the listings below the filters are updated automatically. Filters filter content items based on field values. Therefore before adding a filter, you must first choose an existing field or create a new field to which to apply the filter. 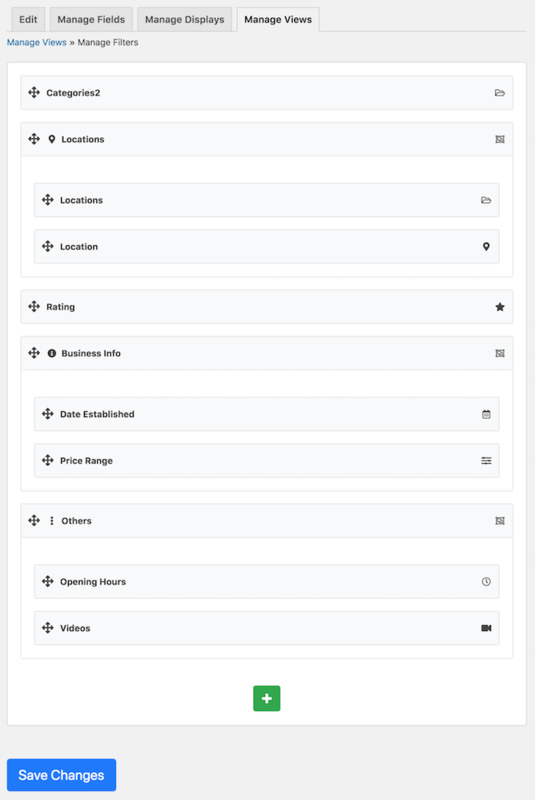 In this section we will add a filter to the Features field of listings. Make sure first that you have already created the field by following the instructions in Adding and Managing Fields - Adding a custom field. Click the Manage Filters button. Each box in the editor is referred to as an element in this documentation. Click the green Add Element button with a plus sign at the bottom of the page which will open a popup window. In the popup window, select the Field tab and click Features. Leave other settings as-is and click the Add Element button at the bottom of the popup window. You can drag the element to wherever you wish the filter to appear in the filter form. Note that the filter form is responsive. That is, filters are displayed in 3 columns only when there is enough space. 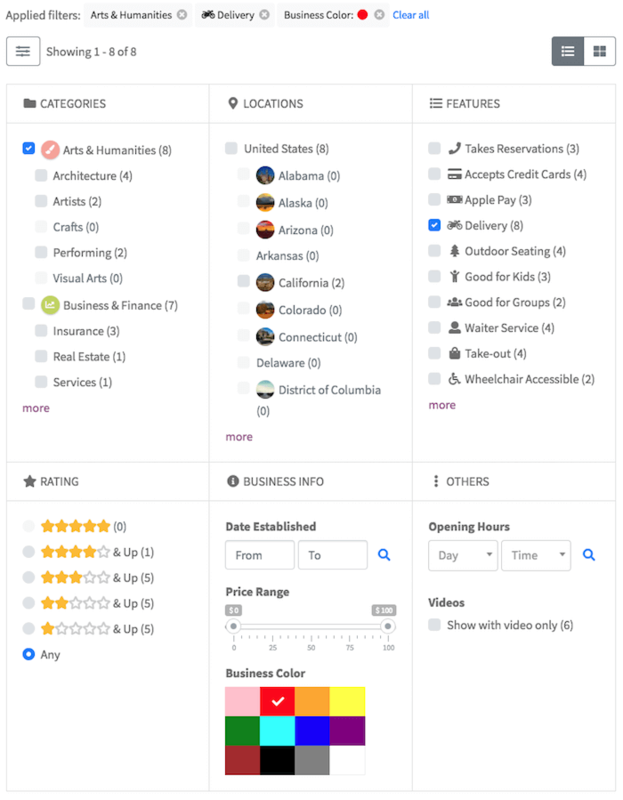 When there is not enough space to show the filters in multiple columns, for example when the filter form is placed in the sidebar or when viewing on a small screen devices, the filters are displayed in a single column. On the filter form editor, hover over to the filter which you wish to delete, and then click the red trash icon. Click OK on the popup alert box. The filter will disappear and is removed from the filter form. Facets counts (post counts that are updated dynamically depending on the current search/filter criteria) are enabled by default. If you wish to disable the feature, go to Directories -> Settings, click the Filters sub-tab and uncheck the Enable facet counts option under the Filter Settings section.